IGEL GmbH understands the client's requests and expectations. IGEL GmbH analyzes the starting situation and possible actions. 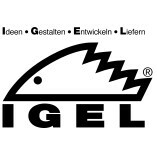 IGEL GmbH is clear in terms of communication. 08/01/2016Sachverständigenbüro für Bau- und I. 06/30/2016Jan D. - DRK Ratingen e.V.